Beat the eggs in a bowl and add the cream. Season. Heat the eggs in a bain marie, stirring continually until the eggs are cooked. Toast the crumpets in a toaster. 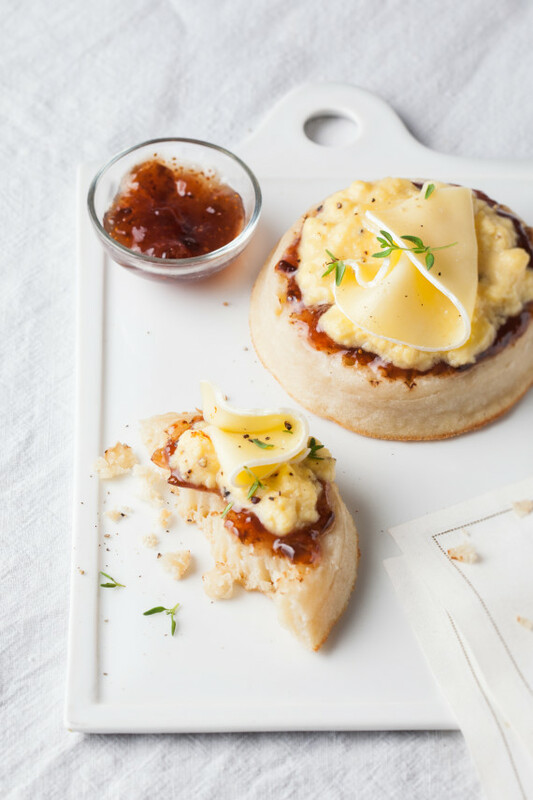 Spread fig jam on each crumpet. Add two tablespoons of the scrambled egg and top with half of Tranches de Brie. Garnish with a little thyme. Serving suggestion: ideal for a brunch! Tip: you can use slices of wholemeal bread instead of crumpets. Discover all the flavor and the creaminess of a Brie cheese in thin slices, ready to taste.